To read the full article, click here. Magic Cabin offers a great alternative to the vinyl lunchboxes, as mentioned in my previous post “Eco-Friendly Lunch Bag”. 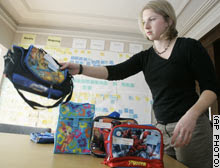 Reusablebags.com also offers several lead-free safe lunch bags for kids children.